Ireland produced one of the greatest victories in cricket’s rich history by beating Pakistan on St Patrick’s Day amid unbelievable tension in Jamaica. Led by their brilliant wicket-keeper batsman Niall O’Brien, they reached a rain-adjusted target of 128 with three wickets remaining in near darkness. Ireland’s fans, who had been there to witness the tie against Zimbabwe, could barely contain themselves afterwards. The result means Pakistan, ranked fourth in the world, are already out. 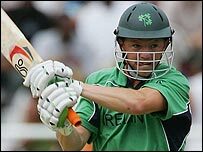 Wicket-keeper O’Brien, axed by Kent in 2006 because they rate Geraint Jones above him, hit a brilliant 72, easily the best effort by any of the batsmen on a green wicket which Ireland’s seamer loved. But when he tried to hit off-spinner Shoaib Malik for six with 21 needed and six wickets still in hand, he was stumped. Panic set in as Andrew White was caught at short leg and Kyle McCallan edged to slip in the next over, off Rao Iftikhar. But O’Brien’s brother Kevin stayed to the end as he and skipper Trent Johnston eked out the remaining runs needed. Ireland could now lose to West Indies and still qualify for the Super Eight stage, but they are not definitely there yet. Pakistan, on the other hand, rated fourth in the world in one-day internationals, go home. Ireland held every catch going, produced some inspired stops in the field and even shrugged off some dubious umpiring decisions. Their only failing was a generous offering of 23 wides, but still Pakistan came up short. The first opportunity for Irish celebration came when Dave Langford-Smith bowled a peach of a delivery at Mohammad Hafeez in the first over, which the batsman edged behind. When Boyd Rankin then had Younis Khan caught in the slips for a duck, the Test nation had to rebuild from 15-2. Imran Nazir (24) and Mohammad Yousuf (15) added 41, but when Rankin and Langford-Smith were replaced by Johnston and Andre Botha, the two big wickets fell. Yousuf drove a wide ball from Johnston straight to point before Inzamam edged his third ball to the solitary slip. Given obvious confidence by that strike, Botha (2-5 from eight overs) began to extract huge inswing and made life intolerable for Nazir. Eventually, the opener departed for 24, Eoin Morgan taking his second catch in the slips. Wickets continued to tumble, despite the best efforts of Kamran Akmal (27), and Johnston’s captaincy was spot on as he brought back Boyd for some extra pace. The bowler dug a couple in, and both Akmal and Azhar Mahmood spooned catches to Johnston at mid-wicket. After Mohammad Sami and Iftikhar had added a gutsy 25 for the ninth wicket, spinner McCallan took the last two wickets as wild slogs were held in the deep. Pakistan had been bowled out for 132 in the 46th over. The wicket was still providing assistance for the bowlers when Ireland batted. Jeremy Bray, the hero against Zimbabwe, was ajudged lbw to Sami, who also trapped Morgan the same way to make it 15-2. O’Brien, who moved from Kent to Northants in January, and William Porterfield added a vital 37 for the Irish. Then Hafeez’s arm ball produced the third wicket, Porterfield playing on to his stumps. But O’Brien took a liking to the off-spinner, cutting and driving for precious boundaries and Pakistan were toiling again. Suddenly, Inzamam’s men were given a lift when umpire Brian Jerling, who had already made some strange decisions, elected to give Botha out caught at short leg. Replays showed the ball missed contact with bat or gloves by nearly a foot. A further 11 runs were added after that before the rain came, and when play resumed the umpires soon began looking at their meters again. But play continued, and O’Brien continued to bat freely. He hit Malik for one straight six but could not repeat the feat. When Iftikhar immediately took his two wickets, 16 were still needed and only seven wickets remained. At this stage, the overs were not an issue, but the ever-decreasing light was. Kevin O’Brien and skipper Johnston eked out the singles, before a Johnston square cut for four and some Pakistan wides finally eased the tension. Finally, Johnston freed his arms and slammed Mahmood into the stands at long-on. The party could begin. 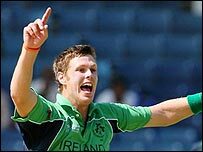 Kingston – St Patrick is convinced Ireland would follow up Thursday’s remarkable tie with Zimbabwe by sweeping aside Pakistan. “St Patrick’s going to perform his greatest miracle yet today,” he said, with a thronging mass cheering his every word and an RTE crew relaying his message back home. “Unfortunately, the Jamaican police were not believers… in the art of fun and decided to pull the divine one aside for a quick chat. It was one of those Santa Claus having his beard ripped off moments as St Patrick, aka Dave O’Connor from County Dublin, disconsolately handed over his staff for safekeeping. You need permission for everything at this tournament and there was no way Dave was getting his instrument through to the Party Stand. Major False Flag Warning for November 6th 2010 ???? ?